PA Minister: "This cowardly attack against a religious and sacred place of worship, without any consideration for its sanctity and its religious and spiritual value, constitutes part of a series of daily attacks against our Islamic and Christian holy sites"
"[PA] Minister of Religious Affairs Yusuf Ida'is condemned the attack against the sanctity of the Jamal Abd Al-Nasser Mosque under baseless and unacceptable pretexts. Ida'is said in a press statement that this cowardly attack against a religious and sacred place of worship, without any consideration for its sanctity and its religious and spiritual value, constitutes part of a series of daily attacks against our Islamic and Christian holy sites, and particularly the Al-Aqsa Mosque, the pearl of Palestine, by the occupation forces and unbridled settlers and under political cover of the right-wing occupation government." The distinction is of significance for the murderer, especially in terms of how the Palestinian Authority decides to view it. If this was a nationalistically motivated crime, i.e., terror - what the PA terms "struggle against the occupation" - then Arafat Arfiah will be entitled to receive a monthly salary under the PA's "Pay for Slay" program with which the PA uses to reward terrorist murderers. Should this be the case, prisoner Arfiah will receive at least 1,400 shekels/month starting from the day of his arrest, eventually rising to as high at 12,000 shekels/month. In a second report, the official PA daily in order to give a more positive spin on the murder, falsely claimed that murder victim Ori Ansbacher was "a female soldier in the occupation army." [Official PA daily Al-Hayat Al-Jadida, Feb. 10, 2019] In fact, Ansbacher was a civilian volunteer performing national service at a youth center. Palestinian Media Watch has reported that PA officials as policy accuse Israelis and Jews of "invading" and "attacking" the Al-Aqsa Mosque and other Muslim and Christian holy sites. Headline: "The occupation raided the Jamal Abd Al-Nasser Mosque, the Sateh Marhaba neighborhood and Al-Quds Street in El-Bireh"
[PA] Minister of Religious Affairs Yusuf Ida'is condemned the attack against the sanctity of the Jamal Abd Al-Nasser Mosque under baseless and unacceptable pretexts. Ida'is said in a press statement that this cowardly attack against a religious and sacred place of worship, without any consideration for its sanctity and its religious and spiritual value, constitutes part of a series of daily attacks against our Islamic and Christian holy sites, and particularly the Al-Aqsa Mosque, the pearl of Palestine, by the occupation forces and unbridled settlers and under political cover of the right-wing occupation government. Ida'is demanded that the international community defend the Islamic and Christian holy sites in Palestine from these attacks, which have become systematic." 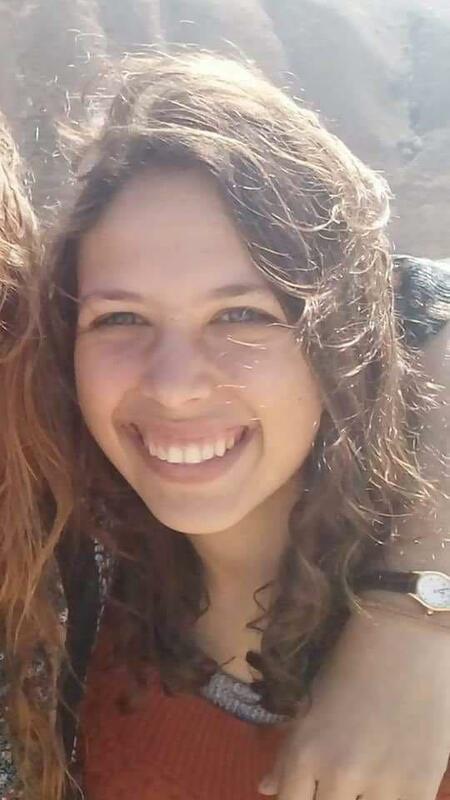 Ori Ansbacher -19-year-old Israeli woman who was brutally attacked and stabbed to death in Jerusalem on Feb. 7, 2019. The suspect, 29-year-old Palestinian Arafat Arfiah, was apprehended on Feb. 8, 2019. Headline: "The occupation claimed that the young person that was arrested in Ramallah is suspected in the murder of a female soldier..."
The body of Ori Ansbacher (19) was found on Thursday evening [Feb. 7, 2019] in southern occupied Jerusalem, and she was buried on Friday at the settlement of Tekoa. In a statement, the Israeli Security Agency revealed the identity of the 'central suspect in the crime' - in its words - and he is Arafat Arfia (29)."